It’s been quite a while since J and I went out for lunch and it wasn’t fast food. L is always so good at restaurants, but we’ve been lazy lately. We run errands then pick up a pizza or fast food somewhere. Last Friday, J had some things to take back to the mall from Christmas and we wanted L to run around a little bit. While J shops, L and I hang out at the little play area near the food court where she tries to make friends with every body. I was in the mood for something other than food court food or fast food, so I asked J if she wanted to go sit down somewhere and eat lunch before hitting up the mall. J was game for it and I, of course, had a place in mind. Anyone who reads this blog knows I love burgers, so the fact it’s taken me a year to get to a restaurant called “Burger Town” is kind of amazing. 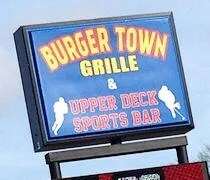 Burger Town Grille & Upper Deck Sports Bar is the long name for a rather large sports bar that opened on the site, but not in the same building, as Mulligan’s Steakhouse & Grill. 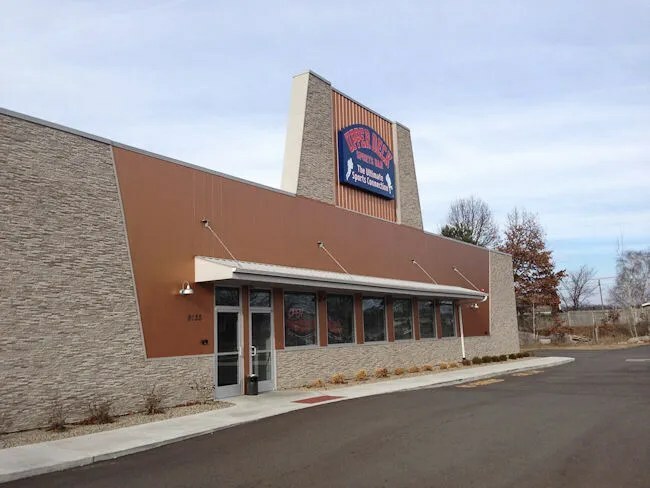 The new building is a large Morton-type building that was built in front of the old restaurant which was then torn down and turned in to a parking lot. It was a little after 1:00 when the three of us walked in to the restaurant. Right inside the door is a large, spacious dining room which is separated from a large bar are that boasts 49 TV’s. I started to head towards a table but J noticed a sign to wait. A waitress saw us standing there and told us to find a seat wherever, so I headed towards the booth I had just started towards a few second earlier. The menu at Burger Town Grille is pretty large and boasts 35 burger combinations. There’s also sandwiches, wraps, and pizza made from dough that is made fresh daily. After getting our drinks (I believe they were Pepsi’s), the three of us were ready to order. The hardest part for me was choosing which burger. Fried eggs and burgers are just something that go so dang well together, so I ordered The Say Hey. The burger, named after baseball legend Willie Mays (The Say Hey Kid), is a half pound beef patty topped with a fried egg, bacon, American cheese, lettuce, tomato, and onion. I upgraded to a pretzel bun for an extra buck and it was totally worth the extra dollar. The burger was very tasty, but a little overcooked coming out more on the well done side of things, but not so far well done that it lost all of it’s flavor. The egg was cooked so the yolk was still a little runny. The pretzel bun soaked up most of the egg yolk so it stayed with the sandwich. The burger came with the choice of house made chips, fries, or Irish potatoes. I chose the fries which I think are bottomless. I was asked if I wanted more, but I was actually quite stuffed from the burger and the fries that came with the plate. J was leaning towards one thing then at the last minute, changed her mind and ordered a wrap instead. She ordered the Crispy Chicken Wrap. 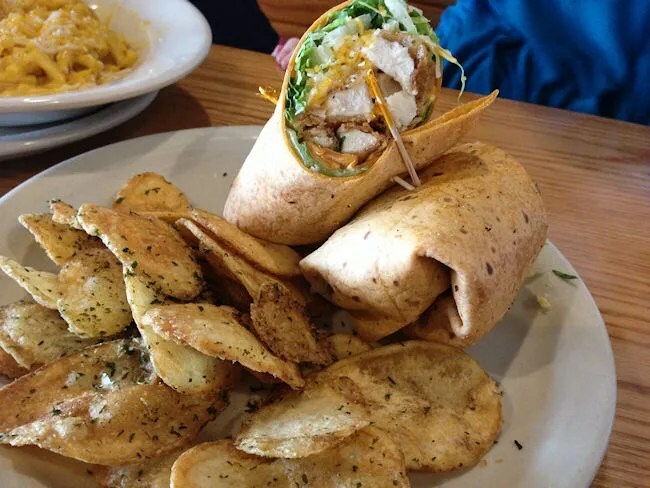 The tomato basil wrap is filled with large pieces of crispy chicken tenders, shredded cheddar cheese, lettuce, tomato, and Chipotle mayo. J left the tomato off as she usually does. The wrap was on the large side and there was a large portion of chicken as opposed to a large portion of lettuce that so many wraps come with. J opted for the house made chips for her side and this was the right choice. The chips were nice and crispy and seasoned with Italian spices and salt. I stole a couple while she wasn’t looking and was really jealous. We gave L the choice of Willy’s Mac & Cheese or chicken tenders. 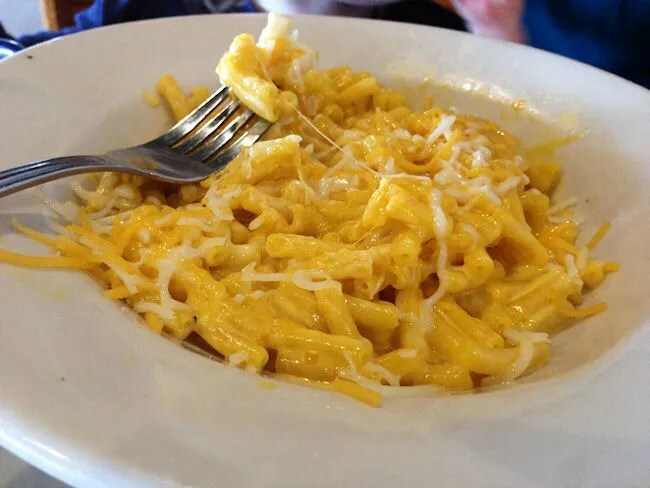 She asked for the mac ‘n cheese which was Kraft mac ‘n cheese with some extra shredded cheese on top. L was a little more interested in the applesauce that came with the plate and J’s chips, so we had some extra to take home for a later meal. The cost of lunch was right around $32 before tip. 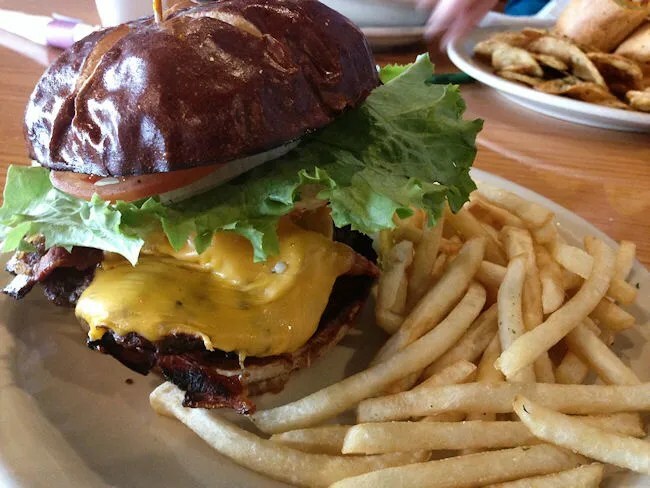 The reviews that are out there for Burger Town Grill & Upper Deck Sports Bar are pretty mixed. Granted, we went during off-peak hours so we didn’t experience any of the service issues I’ve read about. Our server was very attentive and we got our food quickly. All three of us enjoyed our lunches. The only thing I would say about the place is that the large, open atmosphere is kind of odd. I don’t know how the place is during peak hours, but our quite lunch was quite enjoyable.